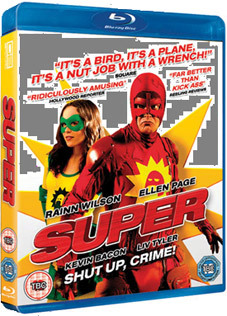 Frank (Rainn Wilson) is an average guy who starts dressing up as superhero named The Crimson Bolt after his wife Sarah (Liv Tyler) leaves him for smooth-talking drug dealer, Jacques (Kevin Bacon – he really is connected to everything). What Frank lacks in superpowers, he makes up for with a trusty wrench in his one-man war on petty criminals. Powers or not, every superhero needs a sidekick. Enter Libby (Ellen Page), a cute psychopath working at the local comic book store. Transforming into 'Boltie', Libby teams up with Frank to take Jacques down. Comic book superhero mickey-takes may have plenty to work with, but walk a precarious path between genuine parody and camp stupidity, but word on the grapevine is that Super, written and directed by Slther's James Gunn is smarter than expected, taking witty parody into unexpected and even unsettling territory. And seriously, who can resist a supehero whose whose motto is "Shut up crime!"? Described by IndieWIRE as "probaby the most subversive and perverse superhero movie ever made," Super will be released on UK DVD and Blu-ray on 1st August by G2 Pictures at the RRP of £15.99 for the DVD and £19.99 for the Blu-ray.